Equal parts showpiece and shot-puller extraordinaire, Jura's new S8 brings attractive design and excellent espresso in equal portions. 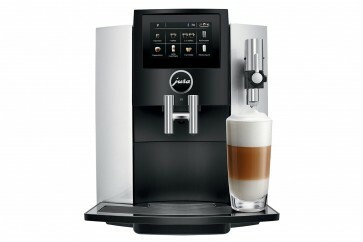 A refinement on Jura's new design style, the S8 flaunts curved lines touched with rich chrome accents. At the center of this luxe look is Jura's newest touchscreen—a bright 4.3-inch LED that makes scrolling through menu options and programming your favorite drinks an easy affair. The touchscreen entirely replaces the buttons and scroll wheels found on other models, giving the S8 a streamlined appearance over the competition. More than just a design piece, Jura's designers also worked in many of their best technical features—a new Fine Foam adjustment lever delivers some of the best milk we've seen from a superauto, while Jura's Pulse Extraction Process (P.E.P) and G3 grinder make for some excellent standalone ristretto. 4.3" Touchscreen - Bright and easy on the eyes, the S8 is entirely controlled through the front-facing touchscreen. Programmable Drink Options - Set up to 15 drink recipes to match your tastes. One-touch Recipes - Once you have your recipes dialed in, you can choose 8 as one-touch options. 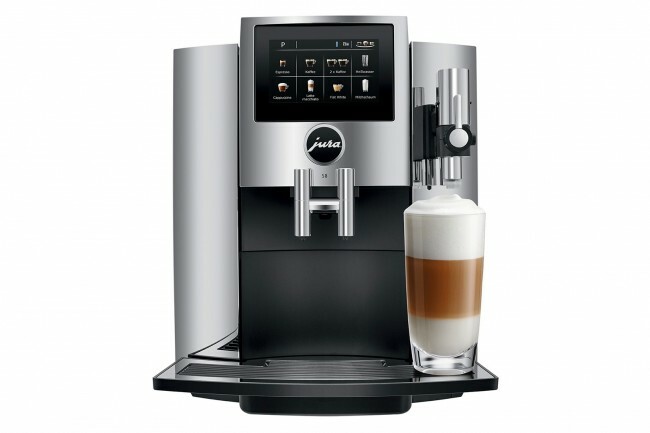 Adjustable Milk Texture - Jura's Fine Foam adjustment lever lets you set your milk from foam-rich cappuccino to silk latte consistency. Smart Water Filter - Jura's CLEARYL Smart filter automatically keeps track of usage and reminds you to replace the filter. Great Milk - Milk texture and consistency on the S8 is no joke, whatever optimizations Jura has done to the siphon design is making for some big improvements. Cool Case - Elegance is often about understatement—something the S8's design embodies. This machine looks seriously good in the kitchen. Touchscreen - Jura's biggest touchscreen yet, it's a marked improvement over the A9's tiny touch-sensitive number. Screen UI - The S8's menu system takes some adjustment, since swiping works for navigation, but not for menu settings. Spouts - The Tüv-certified spouts are great for cleanliness, but guests and infrequent users may be confused about where to put your cup for different recipes. They really did do a great job with the milk texture dial on this machine. While the case bears a passing resemblance to the E6 and E8, the S8 is definitely more premium feeling in-person. Follow On-screen guide for installing and replacing water filter. Soap out dump box and drip tray regularly.